"Frozen Bliss: A frosty, homemade version of that famous coffee shop's macchiato." Whisk together milk, instant coffee granules, sugar, and salt in a large bowl until sugar is dissolved. Stir in the heavy cream, then cover and refrigerate until chilled, at least 2 hours. Pour the chilled mixture into an ice cream maker and freeze according to manufacturer's directions until it reaches "soft-serve" consistency. Transfer half of the ice cream to a one- or two-quart lidded plastic container. Pour half of the caramel sauce over the top, then repeat the layers with the remaining ice cream and caramel. 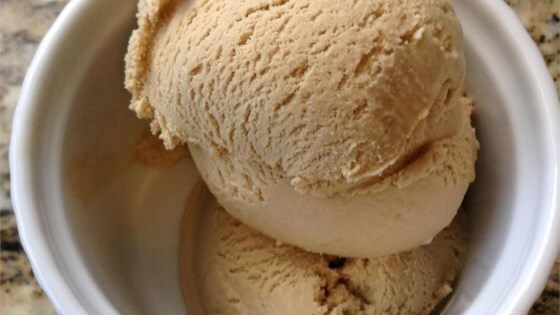 Swirl the caramel into the ice cream using a chopstick or knife. Cover surface with plastic wrap and seal. For best results, ice cream should ripen in the freezer for at least 2 hours or overnight. The longer you freeze it the firmer it will be. I also place a layer of wax paper firmly against the ice cream before freezing to keep out any freezer flavors. Shut up! I love this. I am the happiest pregnant woman in the all the world right now. I used fat free 1/2 and 1/2 instead and heavy cream and it is so amazing. Yum. Thanks! Very Very Very Good.I used Creamy Fudge Dessert Sauce instead of Caramel. Very Good. I used 1/2 and 1/2 in place of the heavy cream.